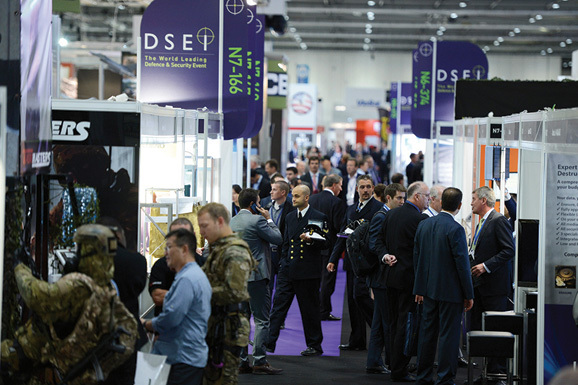 Defence & Security Equipment International (DSEI) attracted more than 32,169 attendees from 10-13 September at ExCeL, London – an impressive 13 percent increase on previous figures. The event featured almost 1,500 exhibiting companies, representing 54 countries, alongside 40 international pavilions, enhancing DSEI’s reputation as the world’s preeminent integrated defence and security event. This year’s event not only proved the most popular to date but it also attracted record numbers of high-profile stakeholders affiliated with the defence and security sectors. 97 official delegations from 56 countries (a 30 percent increase on DSEI 2011) attended, supplementing a complement of over 1,000 additional VIPs (outperforming previous figures by 20 percent) marking yet another milestone for DSEI 2013. On the event’s opening day, the UK Secretary of State for Defence delivered a keynote address which foreshadowed an unprecedented level of support from UK Government Ministers. “This exhibition is an excellent example of the opportunities that we can create when government and industry work together, hand-in-hand, with a shared objective”, said Philip Hammond. Other UK ministers in attendance included the Minister of State for the Armed Forces, Andrew Robathan; Dr Andrew Murrison, Minister for International Security Strategy; Philip Dunne, Minister for Defence Equipment, Support and Technology; Mark Francois, Minister for Defence Personnel, Welfare and Veterans; and Lord Green, Minister of State for Trade and Investment. This exceptional political engagement was matched by the military and international dignitaries present. The UK MOD’s Chief of Defence Staff, General Sir Nick Houghton; Chief of Defence Materiel, Bernard Gray; First Sea Lord and Chief of the Naval Staff, Admiral Sir George Zambellas; Chief of the General Staff, General Sir Peter Wall; Chief of the Air Staff, Air Chief Marshal Sir Andrew Pulford; and Vice Chief of Defence Staff, Air Chief Marshal Sir Stuart Peach attended. The event also welcomed guests from new and traditional markets including high calibre representatives from the Middle East, India, South America, South and Far East Asia, Australasia, the United States and Europe. Meanwhile, away from the exhibition floor, the conference programme included a number of engaging presentations from international speakers including: Mr Ingvar Pärnamäe, Undersecretary for Defence Investments and National Armaments Director at the Estonian Ministry of Defence; Mr Peter Gothe, Head of Strategy Department and Deputy Director General at the Swedish Defence and Security Export Agency; Colonel Cristoph Hegele, German Air Force; and many more. For the first time this year, DSEI staged a number of high level briefings on the show floor to provide an in-depth understanding of a wide variety of topics, including the recovery and rehabilitation of military personnel, cyber security and the cross-over applications of automotive technology into defence. A British Army Symposium, opened by General Sir Peter Wall, saw senior Army leaders and representatives from industry debate the theme ‘Human - the Key to Capability’. Event highlights included the UK Capability Showcase, staged by UKTI Defence & Security Organisation, the Unmanned Systems Showcase - which included daily scenario demonstrations - and the highly popular waterborne capability demonstrations. Visitors were also welcomed aboard the record international flotilla of warships berthed along the Queen Victoria dock adjoining the exhibition halls. The 8 warships comprised of: RoKNS Dae Jo-Young, a KDX-2 class destroyer, and the combat support ship RoKNS Hwa Cheon - the first time the service had visited London since the cessation of hostilities on the Korean peninsula; the Royal Navy’s HMS Sutherland (one of the most recently built Type 23 frigates) displaying the new Wildcat helicopter and the River Class OPV HMS Tyne; the Dutch Navy’s HNMLS Groningen a Dutch Holland Class Corvette; Germany’s FGS Magdeburg, a German Braunschweig Class Corvette; and HSwMS Vinga and HSwMS Ulvon from Sweden two recently updated MCMVs. ions making their debut among the record 40 international pavilions included Indonesia, Japan, Malaysia and South Korea, clear evidence of the importance that these key emerging players place on DSEI. India, a previous exhibitor, increased its presence significantly, mounting both public and private sector pavilions. Other newcomers included Chile, which joined Brazil in representing Latin American growth markets, while the UAE was among the list of Middle Eastern nations at the event. The exhibition floor was characterised by a series of technical innovations and product launches as companies sought to leverage DSEI’s status as the biennial hub for the defence and security sectors. Visitors to the Land Zone had the chance to see Nexter Systems unveil its Titus armoured vehicle, offering superior protection and mobility, while Finnish company, Patria also introduced its next generation Armoured Wheeled Vehicle concept, a brand new design boasting increased payload and suitability for a wider range of missions. Air capability highlights included daily briefings from the RAF presentation team, whilst visitors were greeted by an enviable range of gate-guards which juxtaposed modern platforms such as the Eurofighter Typhoon and the Merlin Mk2 helicopter with historic icons such as the Supermarine Spitfire. There was also a strong showing from maritime exhibitors. Rolls-Royce unveiled a new design for a maritime patrol craft and VeeCraft Marine launched Sea Scorpion, a fully armoured patrol boat. The Supacat multipurpose catamaran was also introduced to the wider marine and renewable energy sectors. Reflecting the prominent focus on security equipment this year, Marshall Aerospace and Defence Group and Philips Healthcare showcased a fully deployable CT scanner, named ‘Brilliance’, for the first time. Meanwhile Fujitsu’s event debut included a range of global secure ICT solutions, developed specifically for the defence and security markets. Humanitarian relief products were on display from a wide range of companies such as Lifesaver showcasing Lifesaver Cube, which provides the only portable water filtration technology to remove all micro biological waterborne pathogens, without the need for any chemicals or UV light. An official ceremony was held between senior representatives from BAE Systems, BMT Group, General Dynamics UK and ISS and the Minister for Defence Personnel, Welfare and Veterans, Mark Francois to sign a new initiative, the Corporate Covenant. The pledge detailed a number of specific commitments that the companies would honour to support the Armed Forces Community, such as promoting the employment of veterans. Recognising the next generation of ‘Rising Stars’ in the defence, aerospace and security sectors, a Lockheed Martin sponsored reception held on the last day of the show welcomed industry apprentices and new recruits from all three services. The event offered a unique opportunity for those new to the industry to network with peers and join an eminent panel of military and industry personnel as they set out the future landscape of defence and security. “The records broken this year demonstrate that DSEI continues to strengthen its position as the world leading defence and security event”, said Event Director Duncan Reid. “Traditional markets such as Europe and North America were well-represented, whilst the influx of representatives from emerging markets, like the Middle East, Asia and Latin America, bodes well for the future”. Across the board exhibitors’ experience surpassed their expectations as they were delivered unprecedented access to government ministers, military personnel, industry representatives and stakeholders from emerging defence markets - motivating a record rebooking rate of 60 per cent during the show. “Even at this early stage I can confidently predict that DSEI 2015, which will take place from 15-18 September, will outperform this year’s edition due to the lasting relationships forged with the UK MOD, international delegations and exhibitors”, said Mr Reid.